« Homepage / Gourmet / "The World According to FOLSE: His culinary universe"
Writing about food and drink and those who create it is a privilege. The finest perk is that people allow us into their worlds. One Louisiana chef has a virtual universe gravitating around his gastronomic talent: John Folse, the state’s homegrown culinary ambassador who dabbles in everything from plantations to a culinary school, product lines, a pastry division, television shows, cookbooks and a dairy offering artisan cheeses. Born in St. James Parish in 1946, Chef Folse has a passion for Louisiana culture and cuisine and is responsible for launching the careers of countless local chefs. This month, Chef Folse is leading a cheese and wine seminar at the New Orleans Wine and Food Experience (see article in this issue of Louisiana Homes and Gardens). He is also hosting his first elaborate dinner at the event, with proceeds going to his students at the Chef John Folse Culinary Institute at Nicholls State University in Thibodaux. 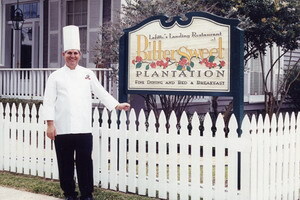 The jovial chef is also presenting a fabulous Mother’s Day feast at his White Oak Plantation in Baton Rouge, while offering special event dinners at his flagship restaurant, Lafitte’s Landing at Bittersweet Plantation in Donaldsonville, his former home. 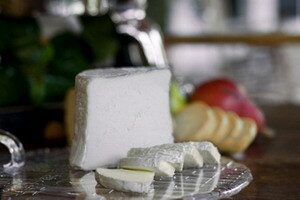 The buffet consists of an extended salad bar that includes a full array of yogurts and cheeses from the Bittersweet Dairy. “We always try to have a roasted duck with a Louisiana fig glaze; we always have speckled trout topped with shrimp; and on Mother’s Day is our first crawfish bisque of the season; then we have mirliton and shrimp casserole, and pecan rice dressing or dirty rice. We make our own hams from scratch. We take fresh hams and sugar-cure them, plantation style.” Prime roast beef and leg of spring lamb are also included. “We have a pastry division, so you have red velvet cakes, lemon meringue pies, as well as sugar free and fat free desserts. We bring a tray to the table and show all our desserts,” he says. A harpist or a jazz band performs for Mother’s Day at White Oak Plantation, which is set on 22 lush green acres in the heart of Baton Rouge (call 225/751-1882). 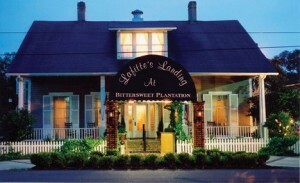 “Lafitte’s Landing at Bittersweet Plantation is my original restaurant,” says Chef Folse. “We’re celebrating 30 years next year. After the restaurant burned down, I reopened it at Bittersweet Plantation which was my previous home in Donaldsonville, about five miles away from the original property. It was built in 1840. I lived in the house for 20 years. I converted into a restaurant, then a B&B that is currently open seven days a week. We have a full staff there, and anyone coming to spend the night can eat there.” Lafitte’s Landing Restaurant, Folse’s cornerstone property, closed in 1998, when a fire destroyed the Viala Plantation in which it was housed since opening in 1978. The restaurant features four dining rooms named in honor of family members and local historic figures. The Gingry Boardroom was named in honor of the builder of the home, Andrew Gingry, while the two main dining rooms are named after the founder of Donaldsonville, William Donaldson. The restaurant seats 80 guests and the dishes are created with locally produced ingredients culled from local farms and fishermen. Two of the bed and breakfast suites are located on the second level of the restaurant and feature luxurious amenities in antique-filled rooms. The house was designed to face the Mississippi River and features a front veranda and high-pitched roof (call 225/473-1232 for information and reservations). 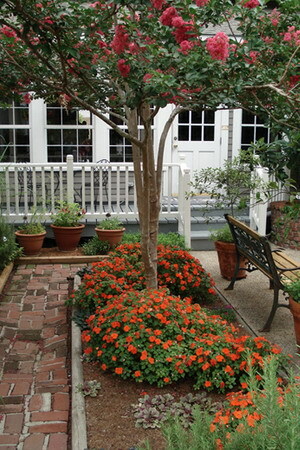 “Dining at Lafitte’s Landing is for special occasions for parties of six or more. Or, you can spend the night and have breakfast and dinner there,” says Chef Folse. 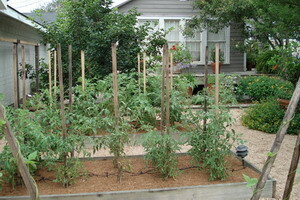 “We have magnificent gardens, and a horticultural team to keep up the gardens every day. The rooms are in the main house, so you can have dinner downstairs and just walk on up to your bedroom,” he says. Special menus can be created for groups. “For dinner, we do our eggplant Belle Rose which is pan-sautéed and topped with lump crabmeat; we do an array of various sautéed fish in season with numerous toppings and sauces; and one of our special dishes is a crawfish stuffed rack of lamb. Since we have a pastry chef in the company, we have a line of Creole cream cheesecakes and Creole cream cheese ice creams, those are our house specialties,” Chef Folse says. If you are not going out for Mother’s Day and you want to serve something special, shine up those martini glasses and serve the eggs à la crème inside, and top them with a little dollop of caviar. It makes a wonderful presentation, guaranteed to make any mom smile. 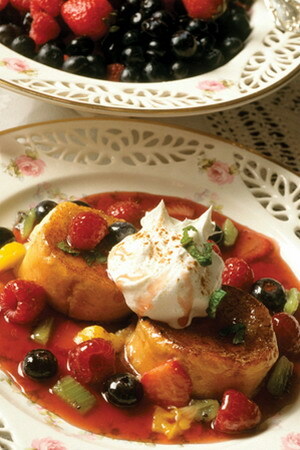 Here you can write a comment to the post "The World According to FOLSE: His culinary universe"